MANHASSET, N.Y., March 21, 2019 /PRNewswire/ -- Northwell Health today announced the opening of its new Surgical and Transplant Intensive Care Unit (ICU) at North Shore University Hospital (NSUH), an important milestone as the health system prepares to launch Long Island's first liver transplant program. The new unit cost nearly $26 million and more than doubles the footprint of the former ICU to 13,000 square feet. It's a key component to Northwell's anticipated opening of its liver transplant program and part of a multi-year modernization project at NSUH that includes a $325 million Advanced Surgical Pavilion. "The state-of-the-art Surgical Transplant ICU at North Shore is second to none and will allow us to offer outstanding and innovative care for our transplant patients," said Lewis Teperman, MD, director of transplant services at Northwell Health. "It was built with Northwell's ground-breaking EICU technology. This allows the surgeon to always be in touch with the patients and care team 24-7 in real time." There are currently about 1,200 people awaiting a liver transplant in New York State, about half of whom live in Northwell's catchment area that includes Long Island, Queens, Brooklyn and Staten Island. NSUH's Sandra Atlas Bass Center for Liver Diseases treated more than 6,400 outpatients in 2018. The United Network for Organ Sharing (UNOS) has already approved Northwell's application. The program is still pending state Department of Health approval. The ICU will accommodate the growth of the hospital's surgical programs with a focus on kidney and liver transplant, colorectal surgery, pancreatic islet cell surgery and bariatric procedures. It features 18 private rooms, three isolation rooms and two family waiting rooms. 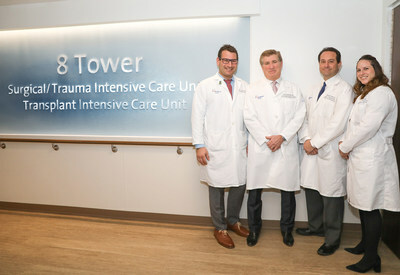 "In addition to supporting Transplant and other surgical programs, the new SICU will have a vital role in supporting North Shore's Level One Trauma Center, which is the largest trauma center in the New York City area by patient volume," said Matthew Bank, MD, trauma medical director of Northwell Health's Trauma Institute. "North Shore's Trauma Center admits over 2,300 patients per year, 700 of which are transfers from other hospitals. We handle some of the most critically injured patients in the region, and now will have a state-of-the-art SICU to complement our Trauma Center." For more information about Northwell Health's transplant services, go to: https://nsuh.northwell.edu/transplant-services. Northwell Health is New York State's largest health care provider and private employer, with 23 hospitals, nearly 700 outpatient facilities and more than 13,600 affiliated physicians. We care for over two million people annually in the New York metro area and beyond, thanks to philanthropic support from our communities. Our 68,000 employees – 16,000-plus nurses and 4,000 employed doctors, including members of Northwell Health Physician Partners – are working to change health care for the better. We're making breakthroughs in medicine at the Feinstein Institute for Medical Research. We're training the next generation of medical professionals at the visionary Donald and Barbara Zucker School of Medicine at Hofstra/Northwell and the Hofstra Northwell School of Graduate Nursing and Physician Assistant Studies. For information on our more than 100 medical specialties, visit Northwell.edu.